The design industry has rapidly expanded in the last year. With the “real world” recognising design for what it really is; a piece of art. This means struggling brands have had to change their direction and shout about something new to stay at the top of their game. Throwing it back to 2018, we saw many big-ticket names like American Express, Burberry, and Waitrose transform their branding. These huge brands revealed new identities with the hope that it will get them noticed in their ever-crowded markets. There is only one word to describe the trend Simplified. Over time, brands can get lost and lose their direction. How to overcome this? Take it back to the basics, business fundamentals, its core personality and pull their journey. Consumers are savvy and they want to know that brands are genuine, clear in their messaging and have a modern approach. Brands are stripping back their mission statements and original vision and values that are recognised by their “followers”. By putting their customers first, businesses are now building branding strategies with their customers at the heart and becoming memorable. This will continue to happen into 2019, when we expect to see more big names jump on the bandwagon, already including WW, Slack, and Mastercard. After years of “stocky” icons, and illustrations; the tables have now turned to creating showcase captive illustrations. High detailed, beautifully executed illustrations have started to create a premium look within a brands. This authenticity allows brands to capture their audience whilst putting their own stamp on their collateral. This is backed by facts, which explains that illustrations convert over seven times better than stock assets. It’s time to invest in personalisation. Two- and three-dimensional graphics and online videos are helping brands make statements online. As content becomes interactive, so does the user. The use of video and animation is improving engagement rate, and businesses are even going as far as animating their logo in 2019! 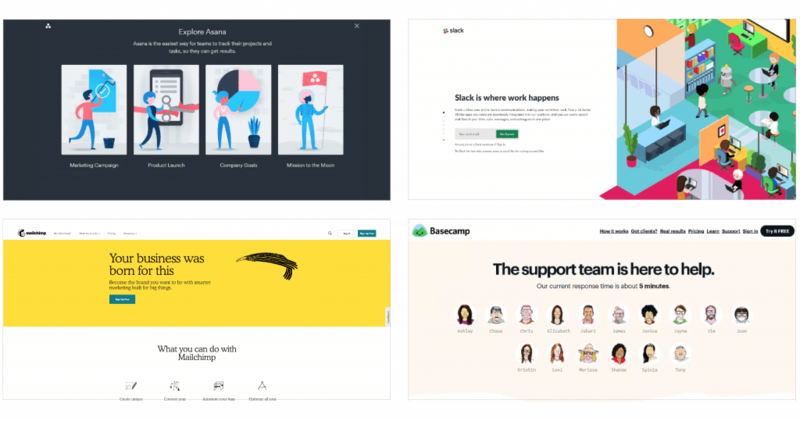 Designers are getting moving with animation, using it to create device mock-ups, walk throughs and social posts to aid users & clients visualise their content. 2018 has seen brands such as “GymShark” and “Mrs Hinch” grow their business empires from 0 to hero simply by social media content. Influencers share honest and engagement content, they have captured their audience and connected with them, building a huge following and giving brands a potential local audience. The use of video content such as Snap Chat, Facebook Live and Instagram Stories, have all dominated video content of late. These videos draw millions of people in and give them a passionate community to engage with. Granted this isn’t a “design trend” as such. But it shows that by using/ re-using your creative content online in the right way can help build your brands. In 2018 designers got bold with colour; colours will continue to be a growing trend in 2019. Pantone revealed their 2019 colour palette …. So, if you want to stand out this year, go bold! It’s not just bold colours alone that are hitting the trends this year but using colours within gradients is sticking. They had a huge comeback in 2017 and is here to stay. Brands like Instagram and Firefox adapting the style already. To conclude, brands are innovating and adapting new styling to grow their online and offline presences. Businesses are creating strategies to hit heart of their consumers, using creative content and animations. Over the next twelve months, we will see more brands take the plunge and build on growing their identities.